Those are beautiful, Sharon! I would like one of those right now! Sounds good Patrice, trying to come up with a few different ideas so one doesn't get burned out on the same thing day after day. Is there a specific place to look for low carb bread, or certain brand? Do you prefer almond flour over coconut flour? I just thought too- after they're done, slather them over the top with butter- it should keep them moist to wrap in plastic wrap then in zip locks and freeze- warming up to still being moist. The pepper I used is cayenne -in the wee chicken shaker ! This thread has been a real eye opener. Didn't know about grass fed butter or how good it was for you, amazing. I can't believe all the high carb foods I have in the house . I was just at the store and saw grass fed butter man it's expensive but looks oh so good. Hey, Rp! This is a pretty good bread to buy. We get it in Reedsburg and Baraboo, so we don't have any problem finding it locally. 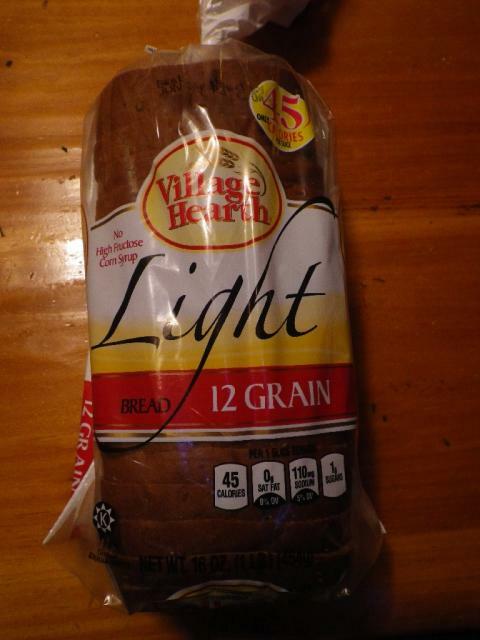 It's 6 net grams of carbs per slice, so if you really want a nice slice of soft bread or toast, that's not bad! They also make a light Italian that's a little higher in carbs, but each slice is a little wider too. I do have almond flour around for trying out on things like breading fish, etc. I have never attempted baking anything with it. I can say that if you coat something with it and fry it, be careful to be very gentle with temperatures and watch it closely. It takes on a burnt taste to me if it gets too browned! Adam, I think I'll have to do some searching to get me some grass fed butter! I would say any real butter is good- better than other things. If it isn't grass fed- thats ok. Real butter as opposed to margarine and like liquid plastic products into the veins , is the point. There's volumes to be said of coconut oil too. Olive oil next. I appreciate the many ways these oils and butters can be employed . I agree the real stuff is so much better. My wife LOVES cooking with coconut oil. A good extra virgin olive oil is hard to beat. Yup them 3 are rock stars for sure. See how Bulletproof coffee is so good with coconut oil in the morning. People in the Himies-Africa-Indo Asia-parts of Europe - and other places, have enjoyed mixtures similar in part to this for centuries. Coconut oil has enduring qualities beyond olive oil in many versatile abilities. Although they both have endearing uses in enjoyment in the art of cuisine. It will be hard to try it as I prefer it black. Both olive oil and coconut oil also have so many health benefits. Well Chickie, I went and did it-I made that cauli "potato "salad today- it was easy and good ! I haven't had cauliflower for decades-but I could just tell your recipe would be good done up that way, and it was ! Just like bland potatoes, the cauli absorbs all the other flavors it is put with, and all the ingredients mixed with it worked fine. I was in a bit of a hurry so I didn't mince the leeks as fine as I would normally but hey-its really good regardless. This week is the warmest yet for the year, in the mid to high 70's, maybe some low 80's thrown in, and a cool but filling low carb salad is perfect ! Great, Sharon! I'm glad that one worked out. 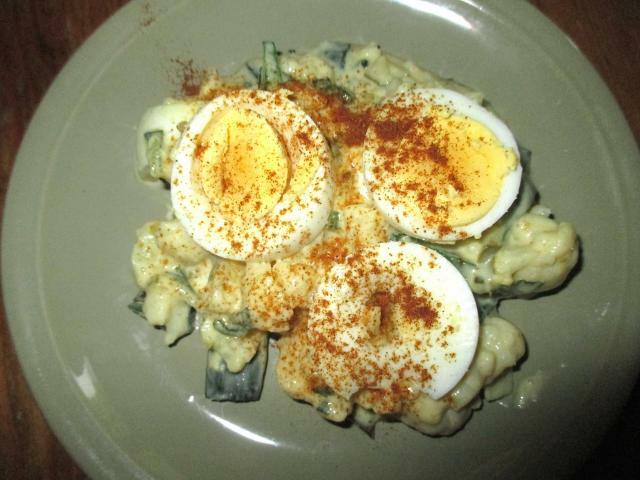 There are some variations on what people like in potato salad too, and with that recipe, I think it's important to put in the ingredients you expect to taste in a mayonnaise based potato salad, and they have enough flavor to carry it and make it taste like good potato salad to you! Yes I appreciated that too- using the same things that give it the exact same taste as with the potatoes. Really, I think its just a matter of expected texture more than taste....a potato- especially russets-are bland, just like cauli. Thats why they need to have things put in with them to dress up the flavor. This is a great substitute in place of heavy carbs and starch. For benefit of others here who may want to do this- do you think this can be froze ? It would be handy to make an amount and freeze it for fast use anytime. I don't know about the freezing, Sharon. If you have a bunch made up, maybe you can take a small amount and put it in the freezer and test it. Then you can report back to the rest of us! The cauliflower would be softer. Maybe that would kind of mess things up? 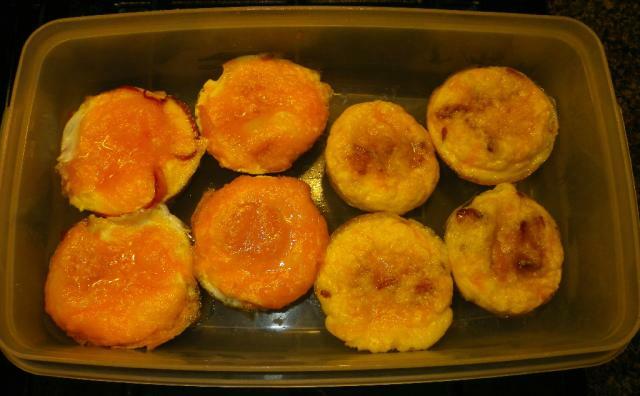 Okay, so I finally got around to making up some more of the low carb egg "muffins" to test out. I made up three kinds: bacon & cheddar, ham & cheddar, and prosciutto & cheddar. I got a lot closer to what I was after. I chopped up and precooked the bacon first. Then I assembled the three kinds. Each had approximately 1 egg, 1/2 oz of cheese, 1 oz of meat. I started by spraying an already nonstick muffin tin with olive oil spray just to be sure I could get them out. 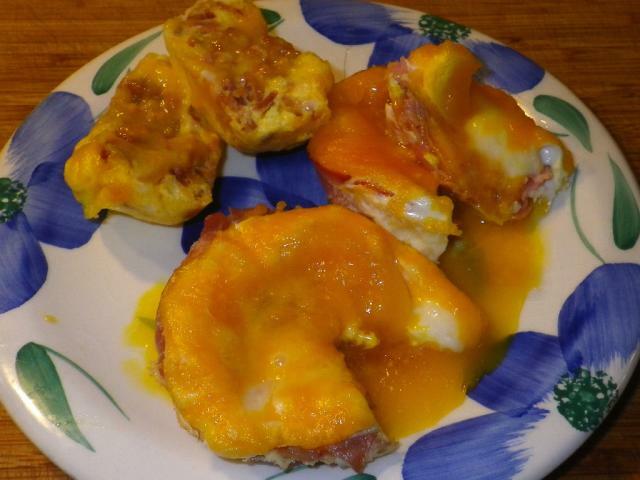 For the bacon & cheddar, I beat the eggs and poured them into the muffin pan. Then I dumped the shredded cheddar and bacon pieces into them. 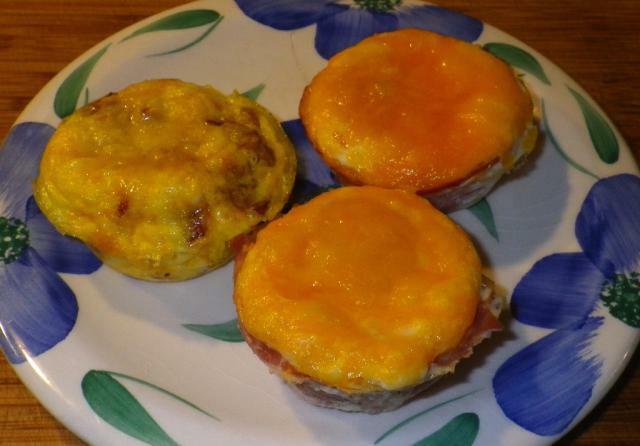 For the ham & cheddar and also for the prosciutto & cheddar, I lined each muffin cup with meat first, dumped in some cheese, cracked an egg into each cup and topped with some more cheese. I purposely broke the yolk in some of them and left the yolk whole in the other ones. I love a liquid yolk but I want these to be good to heat up in the microwave, and the whole yolkers could blow up! This time, I baked these at 350 degrees for about 11 minutes and let them sit in the pan for a few minutes after I took them out. They were not quite set - nice and runny, just the way I like them. Ham & cheddar in front, prosciutto & cheddar in back (all with whole yolks), and bacon & cheddar on the left. Here they are, cut open! Yeah! And here are eight of them, ready to toss in the fridge. I think I will freeze and wrap up a few and then see if I can come up with a recommended microwave time for the frozen ones. That would be nice if the whole thing would be an easy grab, microwave and chow down in a minute or two before work. I'll get back to you one that one! I definitely need to get a deeper muffin pan for big muffins. Mine was too shallow to hold all of the ingredients. I had to pull some egg out of each cup to prevent overruns. You could put any ingredients in these that you normally like in your eggs or omelets, but my main concern was getting the timing down so they would have some room to be heated up again and not be like overcooked rubber later! If I was making these to serve and eat right away, I would definitely not break the yolks so they would have those beautiful runny yolks when they're served. Again, I'll do some more experimenting with freezing and timing - and using larger muffin cups! Well I will sure try that with a small amount. If it works,then its a good thing to know. Oh man, those muffins are amazing ! Im taking notes to enjoy preparing these. I hear you on the shallow muffin pans- my mind is thinking on another type container for those instead of the typical muffin pans. You're right-these muffins can take so many diverse options -different meats and cheeses- seasonings-some with minced bell pepper- or scallions- I bet Italian ground pork sausage would work too- the egg and cheese would bind it enough to hold the shape...just like that new ground beef,eggs, cream cheese and cheese dish I fixed last month. It got rave reviews . Sharon, are you referring to your cheese stuffed meatloaf? Would you have a recipe to share?